Goa has a new reason to be proud, as the Hauns Sangeet Natya Mandal, Ponda, has pioneered the staging of an adaptation of Raymond Smullyan’s dialogue between man and his Maker on the dilemma of possessing free will. 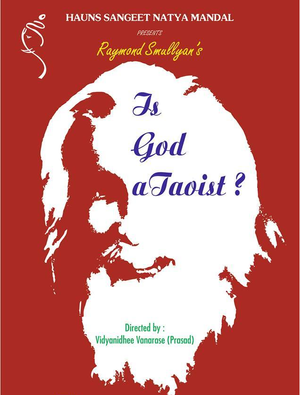 The play is called Is God a Taoist? and is based on Smullyan’s book The Tao is Silent. The ninety-six year-old Raymond Smullyan has a singular career course that has ranged from stage magic to authoring books on Taoism. The nonagenarian polymath is acclaimed for his manifold talents as concert pianist, logician, Taoist philosopher, mathematician, puzzle maker, and magician. In his book, published in 1977, Smullyan gave an understanding of Eastern philosophy to the Western world for the first time. It is Smullyan’s surmise that the Taoist is one who enjoys what he has rather than looking for that which is not in his grasp. The dialogue begins with man urging God to take away his free will, which he sees as the bane of his existence and the reason for his sinfulness. Through a pattern of reasoning, Smullyan presents the paradox of free will where in, eventually, God argues in favour of free will, which is found to be a necessity to avoid sin and maintain morality. With the removal of free will, man would no longer be the feeling and perceptive being that he was created to be. He would, in fact, be no better than a base creature of the lowest order whose sins would be far greater in number and in depravity. It is free will that brings to man balance and the power of choosing right from wrong. Performing a play of this level of intellectualism and complexity was indeed a remarkable feat. The dialogue has been adopted exactly as it is found in the book. This was found to be the best way of preserving the essence of Smullyan’s philosophical debate. Smullyan indeed has an ability to write dialogue that flows effortlessly, marked by the beauty of prose that cannot possibly be simplified or tampered with. It was director Vidyanidhee Vanarase (also known as Prasad) who suggested the book as material for a play. The Hauns Theatre Training Centre approached Vanarase, who is a postgraduate from the National School of Drama, New Delhi, to conduct a three-day workshop. At the end of the workshop, the participants appealed to the veteran director of over fifty plays to direct one for them. The Tao is Silent is a book that Vanarase had time and again used in portions in the past as part of his theatre workshops. This time he decided to use the dialogue in its entirety. He approached the task of increasing the audience appeal by designing a set that would generate a sense of inclusion, unlike that which is experienced in a proscenium theatre. 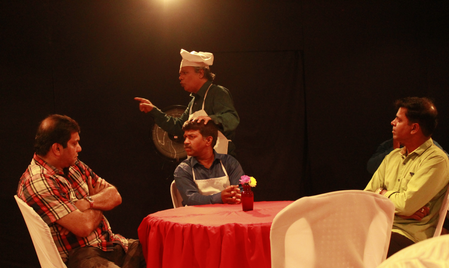 The play is staged in a set-up of a restaurant with eight tables with chairs. It has nine actors and the dialogue is divided between them with four playing God and five depicting the mortal. This breaks any monotony the audience might experience and the restaurant ambience give a lighthearted touch to a profound topic. The audience is seated as the patrons of the restaurant and, as the dialogue proceeds, the questions eliciting an answer of yes or no are asked of the audience. At times they reply, nod, smile, or laugh, and at other times you find them completely motionless, attempting to absorb as much as they can of the philosophical play. Mandar Jog, who is a cast member and teacher by profession, says, ‘Smullyan did not write the play thinking of this sort of an audience who may not be familiar with the concepts of philosophy. In spite of that the audience always finds the play appealing. Some of them have said that you need to see the play more than once because there is just too much to take in during the first time.’ The response of the audience has been that the play has had a powerful impact on their understanding of God and has made them question established beliefs. Is God a Taoist? has had eight performances thus far with four shows at Vijaykumar’s Travelling Box Theatre (VTBT), Ponda; and one show each at Gomant Vidya Niketan, Margao, Sanskruti Bhavan (Prayog Saanj), 6 Assagao, and Carpe Diem, Majorda. 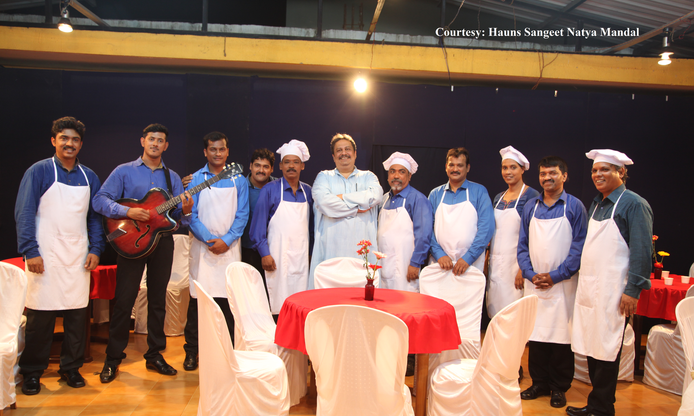 The cast comprises of Somnath Naik, Mandar Jog, Govind Bagkar, Chatura Raikar, Savlo Phadte, Vijaykumar Naik, Santosh Naik, Sudesh Naik and Sudesh Amonkar. Mandar says, ‘We were already questioning things as they are and so we identified with the script. That is why we decided to do it.’ It was a journey of learning for the actors too as they became acquainted with words and ideas they had not encountered before. They had to read about Taoism and other subjects to prepare themselves for the play. Soon Is God a Taoist? will be performed at three venues in Hyderabad: La Makaan, a café and cultural space, SLN Terminus Adda, a shopping mall, and Gallery Café. The cast has hopes of showing the play in as a many places as possible, in Goa and outside the state too. It is a play everyone must watch to address one’s own metaphysical queries that may be in one’s conscious or subconscious mind.